Are you looking for a way to encrypt your pen drive (USB memory) and enable password protection for it? Windows 7 and 8 can enable password protection on your external memory stick using Microsoft's BitLocker technology. Using this feature you can encrypt the data stored in flash memory and assign a password to prevent unauthorized access to those data. If you don't want to set a password you can use your smart card to unlock the flash drive. To use Microsoft BitLocker feature to encrypt flash memory, follow the steps below. 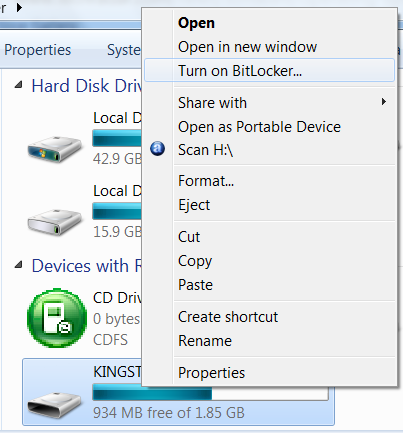 Now the BitLocker feature starts to encrypt the flash drive and its content. You should not remove the connected device from your computer during this process. Now you will be prompted to set a password or smart card protection for the flash memory drive. Here you need to enter your password which is needed to unlock the USB drive to continue. You need to enter the string twice to verify it. You can have another mode of security for the Universal Serial Bus device. After enabling BitLocker feature you need this password to access data stored in the flash drive. It is essential to configure security for data stored in external memory using to prevent unauthorized access to it by others. It is common that we may misplace the USB stick and others get a chance to access the content in it. If there is no protection, he can easily get access to the content stored in it. If you have stored any sensitive data in it, it will be a complicated issue. However, by placing a login window to access the files stored, we can prevent others from seeing or copying content from this external storage unit. Later versions of Microsoft operating systems like Windows 8 and Windows 7 has the ability to set a password on any memory units connected to Universal Serial Bus. As long as the password is secret, you can assure the safety of the data saved in it.